Friends of the Earth Ghana held a press conference to raise awareness of current problems and challenges in Ghana’s cocoa sector such as deforestation, child labour, poor pay for cocoa farmers, unfair distribution of value along the cocoa value chain, low cocoa productivity, lack of law enforcement, poor forest governance and decision making, and political interference in the forest sector, and some of the initiatives emerging to address them. This is part of the Cocoa Countdown to Christmas. Mr. Glenn Kwame Asomaning, Researcher at the Nature and Development Foundation (NDF), acted as Chair for the event. In his opening remarks he noted that Ghana’s Eastern Region had been a major cocoa producing area but, due to deforestation, cocoa production has drastically declined there. Brong Ahafo Region, Ghana’s bread basket, also cannot support cocoa because the forests are gone. He stressed these are clear indications that cocoa needs forests to survive and thrive, and yet they are still being cut down, even by the cocoa farmers themselves. 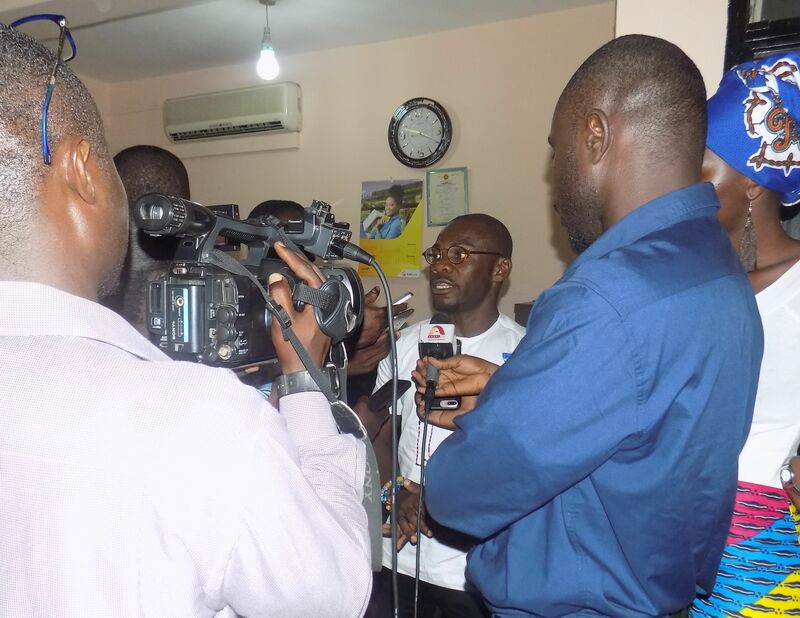 Mr. Dennis Acquah, Project Coordinator at Friends of the Earth Ghana, began by presenting FoE-Ghana’s press statement. Cocoa is the most important cash crop to both the Ghanaian economy and as the main source of livelihood for over a million farmers. Ghana is the world’s second largest producer of cocoa, and exports about 800,000 metric tons accounting for over 9% of the country’s GPD. However, not all news about this cherished crop is pleasing to the ear and sight. Over the ten years between 2000 and 2010, Ghana lost a total of about 820,000 hectares of her forest area at a rate of 1.4% per annum and this jumped to a staggering 6% in 2011. Even now deforestation is around 2% or 132,000 hectare per annum, one of the highest rates in the world after Togo and Nigeria. Much of this deforestation is due to the cherished cocoa crop: it is estimated that cocoa farming alone accounts for about 50% of all forest lost by agriculture in Ghana’s high forest zone. Forest experts have warned that Ghana’s natural forest risks being depleted in the next 10 to 20 years. In response to these threats and after intense pressure from civil society organisations, the government of Ghana and Cote d’ivoire in November 2017, agreed to a framework for action by committing to ending deforestation in their cocoa supply chain. The framework for action includes promoting forest protection and restoration, respecting cocoa farmer’s rights and promoting sustainable livelihoods for cocoa farmers. Reforms in cocoa/chocolate companies. Most major cocoa and chocolate companies embraced deforestation-free cocoa policies after Mighty Earth’s reports came out. Some indeed have gone beyond, to make broader cross-commodity commitment (like Cemoi, Hershey’s, and Ferrero). In less than a year, around 80% of the world cocoa/chocolate market has agreed to deforestation-free cocoa worldwide. Producer countries act. Three countries have published national plans to end deforestation in their cocoa production: Ghana, Côte d’Ivoire, and most recently Colombia. Ghana just revealed its big new plan to implement its cocoa commitments on July 23. Cote d’Ivoire is building a USD 1 billion fund to protect its forests and is in the process of reforming a host of laws and policies to protect forests better, particularly from cocoa. Brazil, Bolivia, Belize, and the Dominican Republic may also be considering committing to Deforestation-Free Cocoa with their own law/policy changes. Consumer countries wake up. The EU Parliament will likely debate a law to clean up all cocoa coming into its borders, particularly focusing on deforestation and child labor. On July 11ththere was the first-ever EU Parliamentary hearing on the issue, which was very successful. Spread of agroforestry. There’s been some progress on pushing the cocoa industry to shift to agroforestry and away from full-sun monoculture. As much as 30% of the world’s cocoa appears to be covered now by agroforestry commitments to make cocoa a more truly “forest-friendly” commodity. Reforms in the supermarket. For the first time ever, supermarkets are rallying and organizing to commit to selling only sustainable cocoa. A group of retailers led by Tesco organized this summer to embrace zero deforestation cocoa. While Ghana can be commended for committing to end deforestation in cocoa farming, there is the need to speed up with the National Implementation Plan on the Cocoa and Forest Initiative as reserve encroachment by cocoa farmers continues unabated. The farmers are motivated by the government’s desire to increase cocoa output to a million metric tons annually as well as the political interference in law enforcement, to clear forest lands for farming. So farmers are moving fast to establish new farms before the implementation plan is imposed. If the cocoa sector continues with business as usual the forest will disappear at an alarming rate. Actual works on the ground are urgently needed to reverse the declining trend in the country’s forest resources. FoE-Ghana is therefore urging government to take a tough stance on cocoa led deforestation by equipping the Forestry Commission to increase their forest monitoring activities to prevent reserve encroachment before it happens. 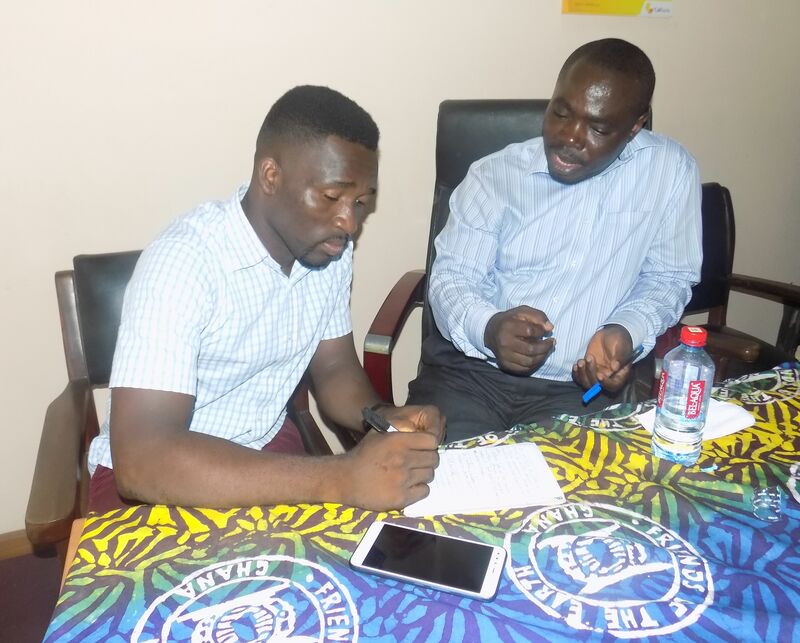 There is the need for collaboration between the Forestry Commission and Cocobod to sensitize farmers on the effects of deforestation and also work to enforce the laws to prevent further reserve encroachment. Farmers also need support with sustainable farming techniques so they can maintain and increase their harvest without the need to cut more forest. For our cocoa farmers, FoE-Ghana is asking for a fair cocoa price for their hard work. It’s unfair that the two leading cocoa producing countries that accounts for over 60% of the global cocoa output, in 2015 between them earned only 5.7 to 8 billion dollars from a chocolate market worth over 100 billion dollars. Cocoa farmers in Ghana and Ivory Coast earn just 5% to 6% of that value. This is highly demotivating for farmers and calls for urgent action. Some farmers in the Amenfi West, Amenfi Central and Amenfi East District of the Western Region-the leading cocoa growing region in Ghana – are cutting down their cocoa farms for rubber plantations. According to these farmers, rubber plantations are more lucrative than the cocoa farms and also working on the cocoa farm is more difficult than on the rubber plantation. This will challenge government’s determination to increase Ghana’s cocoa to a million metric tons annually. Faced with the challenges of farmers converting their cocoa farms to rubber plantations, cocoa farm expansion into forest reserves and encouraging the Ghanaian youth to go into cocoa farming, there are more than enough reasons for Government to push at the international platform for a fair and sustainable financial package for our farmers. Also gains made in the cocoa supply chain cannot be sustained if government does not adequately address the problem of child labour in the cocoa sector. The 2018 barometer report indicates as many as 2.1 million children are engaged in the cocoa fields in Ghana and Cote d’ivoire alone. This means a high level of school age children have not only abandoned their education but are also exposed to harmful chemicals in spraying and fertilizer applications and attacks from dangerous animals. This will have both immediate and long term effects on the children. Increased cocoa production, poverty, low pay for cocoa and the lack of infrastructure such as schools are some of the reasons for child labour in the cocoa communities. Ghana may risk being black listed by the United States once more for not doing enough to eliminate child labour in the cocoa communities. Through collaborations with cocoa farmers and other stakeholders, government can reduce child labour through awareness creation programs, continuing to demand a fair return for farmers so they can afford to pay adult farm workers and provision of basic infrastructures. FoE-Ghana as an environmental NGO with a mission of conservation and sustainable use of the world’s resources believes Ghana has a great opportunity to restore its degraded forest whiles protecting the remaining forest resources if the laws are allowed to work. Mr. Obed Owusu-Addai, Campaigner at Ecocare Ghana, followed by outlining two major problems within the cocoa sector: one being governance and the other sustainability. On governance, he said that, while the Ghana Cocoa Board (COCOBOD) is very technically competent, the wrong decisions are being made by politicians regarding the cocoa sector. This is exacerbated by the change of government every 4 or 8 years that sees COCOBOD used to play politics as it is swapped around government ministries including the finance ministry and agriculture ministry with changes in government. These moves complicate internal processes and external relations, as well as slow and reverse progress made. Obed suggested COCOBOD should be allowed to stand on its own so it can make its own decisions without ministry influence. On the problem of sustainability, he stressed that Ghana has rich soils but some areas that once produced cocoa are no longer able to do so because poor decisions have been implemented. Ghana’s forest reserves were created to produce the right micro-climate for cocoa, but bad decision making has led to encroachment in the forests, causing the perfect microclimate to be destroyed. What is little understood, unfortunately, is that with the loss of the forest and the microclimate, the cocoa cannot survive because of the heat and the declining rainfall. Forests help cycle the rain further inlands, so if the forests are gone, the rain also stops. Obed also noted that Ghana’s laws have been established to protect the forests but they are not being implemented or enforced, so when people cut the forest illegally, nothing is done. He cited specific examples where farmers have encroached illegally into protected forest reserves but that COCOBOD, MPs and Ministers have intervened in support of the farmers and stopped the Forestry Commission from evicting them. He stressed that he does understand farmers do not get a living wage from cocoa farming and that this results in farmers expanding the size of their farms to increase their revenue, so there are complex reasons behind deforestation that require diverse and complementary solutions from many stakeholders. The lack of forest guards and the embargo on their recruitment is another issue that compounds forest loss. The worrying link between forest loss and climate change was also highlighted. 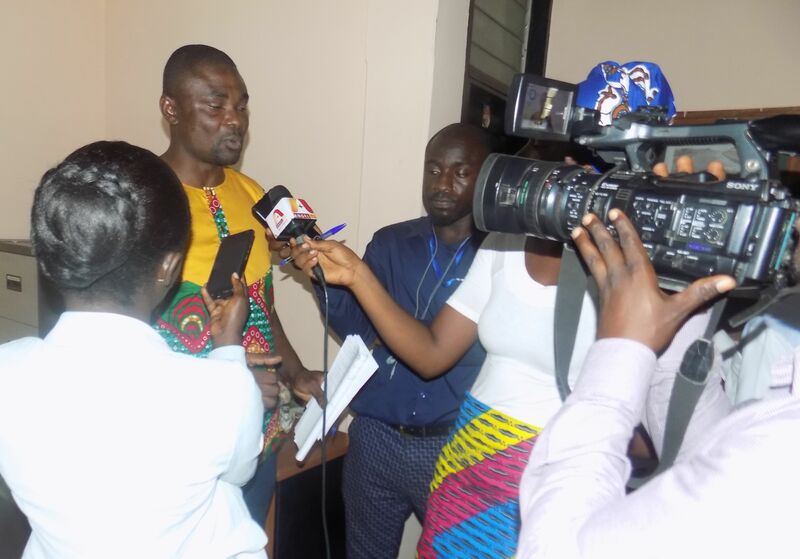 Obed urged the need for more sensitisation and capacity building for farmers to learn about the importance of the forest for their cocoa productivity, and also stressed that politicians must allow the technicians (Forestry Commission and COCOBOD) to make the decisions without any interference from them. He said Ghana needs to discuss the governance challenges and ensure the country makes the laws work through proper enforcement. If the EU does implement a law to rejects any cocoa or chocolate that has links to deforestation or child labour, Ghana will need to prove its cocoa can be approved for import into the EU. The Chair, Mr. Asomaning, touched on the concern that youth do not want to go into cocoa farming due to low pay and also the problem of access to land for the youth. Land tenure is also a problem for existing cocoa farmers and impacts on the farm’s productivity for which farmers have two choices. They can either expand the size of their farm to plant more trees, which may include cutting the forest down, or they can cut their old cocoa trees down when they become unproductive (around 25-30 years) and plant new cocoa seedlings. But the problem is that farm tenancies are usually for a set term, say 25 years, or they expire when the cocoa trees die, which is more common. Thus cutting the cocoa trees down intentionally brings an end to a tenancy and the need to negotiate a new agreement for the land, and the land owner will most certainly increase in price. This is a major reason why farmers tend to increase the size of the farmers, and is an issue that must be addressed for sustainability in the cocoa sector. The Chair also said that historically farmers have gone into cocoa farming because it was a secure livelihood, but that farmers are now losing their confidence in the sector (e.g. due to low pay and declining productivity) and are instead converting their farms to other crops (e.g. oil palm is an increasing concern in Ghana and other West African countries). He also noted that farmers do not realise how they are harming their own futures when they cut the forest down. He said that for the first few years the cocoa trees produce very well, but that productivity declines from 5 years and then the farmers realise they need the trees they have already cut down, by which time it is too late. Besides shading the cocoa from the hot sun, forest trees also nourish tropical soils as the leaves fall and add fertility to the soil. When the trees are gone this source of soil fertility is also gone and is a major reason why cocoa productivity declines over the years. During the discussions, Obed noted that Ecocare and partners (Child Rights International and Rainforest Alliance) are educating Farmers Based Organisations to recognise child labour so it can be better addressed. A fair price for the cocoa would help farmers send their children to school, and so Obed urged that producer countries must come together to negotiate prices with buying companies. If they demand the same price as a strong and unified group of countries, the companies will have less choice not to pay because, without cocoa, they cannot produce their goods. Producer countries need to urgently strengthen their bargaining position. Mighty Earth has just released a report one year on from their ‘Chocolate’s Dark Secret Report’ investigating progress towards sustainable and ethical cocoa production in Ghana and Cote d’Ivoire. As the report qhighlights, cocoa-led deforestation and child labour a7re both still very present in the cocoa sector of both countries despite pledges made by their governments and the cocoa companies. It is yet another example of corporate greenwashing.